If you read American Police Beat, you’ve probably heard of Chief Leonard Campanello. 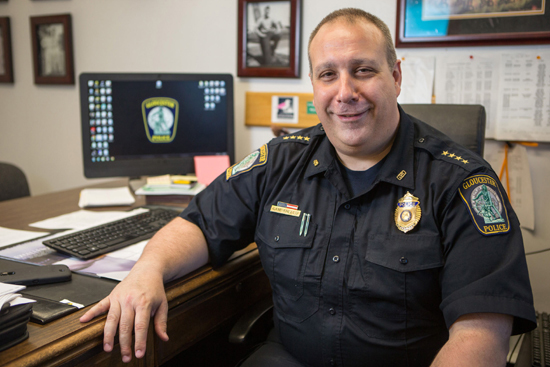 The Gloucester, Massachusetts, police chief is gaining national and international attention for a common-sense program he started, which deals with opioid addiction. If addicts want to kick drugs and have nowhere to turn, they can come the Gloucester PD, where they’ll get help finding treatment rather than being arrested, released, and then arrested and released some more. Campanello’s innovative program (see the July issue of APB for the full story) is not the kind of thing a lot of bosses would try, and there’s been some pushback. As many Americans are beginning to understand the role the pharmaceutical industry plays in increasing rates of drug addiction in the U.S., some people are asking that these multi-national companies be held accountable for flooding the market with dangerous and wildly addictive drugs like oxycontin. Campanello recently asked his Facebook friends to email the drug companies with a simple question—a classic grass-roots approach to civic responsibility. Needless to say, Big Pharma didn’t wait long to send out the attack dogs—or attorneys, as they’re sometimes called. “The police have a lot of nerve trying to target private citizens to do things the police should do,” said attorney Harvey Silverglate, based in Cambridge. Sometimes you just have stand back and marvel at the willful ignorance and slavish devotion to power that some people exhibit regularly. The idea that an innovative police chief asking his Facebook followers to send an email or a letter is in “bad taste” is as laughable as the idea that the drug companies don’t make a killing on addictive drugs. What would Chief Campanello have the drug companies do? I am: a cancer survivor; had full shoulder joint replacement following years of horrible pain from arthritis; endured 5 surgeries in the past 3 years and currently handling scoliosis and arthritis in my low back. I am the consumer of the opiate drugs targeted. Even with my law enforcement history, I am made to feel like a criminal every time I need to have the current pain medication prescription refilled. Complaining without suggesting a practical solution is just that: complaining. We don’t need whining; we need solutions. So Chief: what should be done to resolve this problem? I was an Oakland (CA) cop and retired on a disability. For 42 years, I lived on all types of prescribed narco-drugs. Of the 7 “pain doctors” I saw for 40 years, I too felt like a criminal. Taking a urine test to get a script was insane. I was also questioned for needing my RX 1 day early – to attend a party with my former beat partners. I literally was told to bring in my airline tickets to prove I would not be available the following day for my pre-set appointment. Folks, that’s our DEA in action. Of all those doctors, only ONE threw me a lifesaver. A fairly new drug (Suboxone) that is used to wean addicts off narcotics, is also prescribed as a pain reliever. It operates NOT by producing endorphins to confuse pain signals or get you high. Instead, the drug hits a different brain receptor and there is NO HIGH, NO ADDICTION. The film strip form of medicating (sublingual) is made by made by “Reckitt Benckiser.” The active ingredient also comes in a 7-day wearable patch (Butrans) which is made by “Lohmann Therapy Systems (LTS).” When I’m wearing my patch, I rarely need a medicated strip under the tongue – the patch “stops” almost all pain. I no longer need to carry “spare doses” in my pockets – the patch works and it lasts 7 full days! I’m hoping First Responders will soon find out about this non-narcotic/non-addicting pain medication, They can kick the narcotics and really get their lives back. Maybe get their careers back!